Pentax Ricoh has discontinued the K-01, just 12 months after it was introduced to the line-up. It was a compact system camera which was compatible with the company's legacy of K-mount lenses and featured an APS-C sized sensor. By contrast, the other compact system cameras in Pentax's range feature a small sensor and proprietary lenses. The Pentax K-01 was announced in March of 2012, and was designed by Marc Newson, who had previously been involved in furniture and watch design. Its large boxy design was one of the more unusual on the market, and never really captured the imagination of the consumer. Around the same size as an entry-level DSLR, some questioned the point of owning something which wasn't any smaller than the cameras already in their range. Now, just a year on from launch, the camera has been discontinued by Pentax. It seems unlikely that it will be replaced by a K-02, though there have been some suggestions that a K-mount module for the Ricoh GXR could be on the cards. 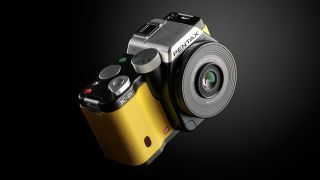 Towards the end of last year, Pentax unveiled the Pentax Q10, the world's smallest compact system camera. Featuring a small, compact camera sized sensor, the Q10 is seemingly proving popular in Japan, where it has reached top 3 on the best-seller charts on a number of occasions. Earlier this year, the company announced it would be making the Q10 available in 100 different colour combinations. It seems for now at least, Pentax is concentrating on its Q range.